The January pick for the Webster University Book Club is showing up on a number of “Best Books of 2015” lists. 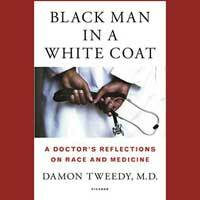 Damon Tweedy’s Black Man in a White Coat: A Doctor’s Reflections on Race and Medicine tells both the story of Tweedy’s medical school experiences as an African-American man interspersed with a broader discussion of health and health care issues related to race. Readers learn of the bewilderment Tweedy feels when his own professor at Duke University Medical School asks him if he was sent by Facilities to change the light bulbs. We also learn through Tweedy’s experiences how many health issues have a racial component whether it is an increased likelihood of health problems or difficulties accessing and navigating the health care system. We’ll discuss the book and the issues Tweedy raises on Monday, Jan. 11, at noon in the Library Conference Room. Everyone is welcome. To learn more, check out this NPR Weekend Edition interview with Tweedy.